His missionary zeal for seeking deep, unsuspected meaning in art is as unrelenting as it is persuasive. You can’t fail to be astonished by his shock and awe stagings of Bach passions, Handel oratorios, Mozart operas, and seven collaborations with John Adams. Musical America’s Artist of the Year is unlike those of years. He is not an instrumentalist or ensemble, nor is he a vocalist, conductor, composer, choreographer, or concert hall. But he has enriched and empowered them all, as he has librettists, visual artists, actors, dancers, students, even chefs. 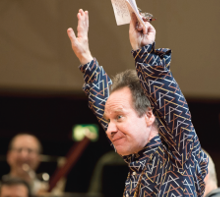 Peter Sellars is Artist of the Year only because Musical America has yet to institute an Oracle of the Year. Sellars is, of course, a well-known and periodically controversial stage director immediately recognized by his porcupine hairstyle (which he cuts himself ), colorful clothes (acquired in thrift shops and on world travels), homemade beads, explosive laugh, and provocatively stirring public speaking. Sellars has, as well, headed (and at times been accused of running into the ground) festivals and theater companies. He is an inspiring professor at UCLA, has galvanized world leaders at Davos on the necessity of nuclear restraint, and initiates global arts and culture programs on social issues wherever he works. A world without Sellars would be one in which there may never have been an opera from John Adams or Kaija Saariaho, or an opera that had legs from Osvaldo Golijov. Lorraine Hunt Lieberson might have remained Lorraine Hunt the freelance Boston violist and chorus singer. Messiaen’s Saint Françoise d’Assise would never have entered the international opera repertory when it did. The Los Angeles Philharmonic would be less progressive and Esa-Pekka Salonen’s career would have, no doubt, developed differently, as would have Dawn Upshaw’s. Latino gang members in East L.A. would not have appeared on stage in a play by Jean Genet and gone on to productive lives in their community. Don Giovanni would have never eaten a French fry in Spanish Harlem, and who knows how the Handel opera revival would have turned out, or if it would have turned out at all? You can’t miss Sellars these days. Thanks to ,him, the Berlin Philharmonic dared stage Bach’s St. Matthew Passion, most recently at the Park Avenue Armory to triumphantly open Lincoln Center’s White Lights Festival. The Metropolitan Opera became a stimulant for artistic deliberations on the Middle East situation with Adams’s The Death of Klinghoffer, another Sellars conception. For the first time, the Polar Prize in Sweden awarded the so-called Nobel Prize for music to a non-musician when it handed Sellars a million kroner at this summer’s ceremony. English National Opera in London this season named Sellars director-in-residence. But Sellars is just as likely to be found spending months at the Perm Opera in Russia, rehearsing 18 hours a day as he rethinks Purcell’s The Indian Queen as a grand four-hour epic on a set backed by a Los Angeles graffiti artist or staging a chamber-sized, 90-minute reduction of Shakespeare’s Midsummer Night’s Dream in tiny Stratford, Canada. What ties Sellars’s myriad activities together is his missionary zeal for seeking deep, unsuspected meaning in art and for his unrelenting persuasiveness. Upshaw has said that when working with the director there is no place for her to hide psychically and that every project with him changes her. Speaking of the St. Matthew Passion, the Berlin Philharmonic’s music director, Simon Rattle, credited Sellars with tricking “an orchestra of enormous egos into leaving their egos in their music cases.” The late Gerard Mortier, one of the opera world’s great revolutionaries, called Sellars his mentor. In a recent staging of Handel’s oratorio Hercules at Lyric Opera of Chicago, for instance, Sellars found parallels between the Greek hero’s painful homecoming from battle and a crisis we recognize every day in America. The ultimate horror of war can be returning home from war with post-traumatic stress syndrome and becoming an outcast. By inviting veterans, many of whose lives had been torn apart by their service, to rehearsals at Lyric Opera, Sellars engaged singers with real-life struggles. The director’s insistence on art as moral action translated into mesmerizing performances, particularly Eric Owens’s stunning Hercules. The bass baritone is another of the singers to have grown to greatness under Sellars’s guidance. The vets, in turn, discovered just how age-old their situation is, and the production gave them permission to speak about it. Handel is a good place to begin, because that is pretty much where Sellars’s career began, with a sassy production of Orlando at the American Repertory Theater in Cambridge, Massachusetts, in 1981. He was 24. He had graduated the previous year from Harvard University. It was the first staging of Orlando in America. He did four years later with a production of Handel’s Giulio Cesare at a summer festival in Purchase, New York. Performed note-complete, with all da capo repeats observed and alternative arias included, Sellars showed Julius Caesar to have been a precedent of an American president coming to Cairo to naively meddle with the Middle East and only make a bigger mess. This was also the operatic debut of Lorraine Hunt, who a year earlier had failed a Met audition but in whom Sellars recognized greatness. Through his mentoring, one of the most extraordinary singers in modern American opera rose to that greatness. For her unforgettably affecting last stage appearance in 2005, Sellars staged two Bach cantatas as a preparation of the mezzo’s death from breast cancer a year later. Shock and awe, ever a part of his theatrical arsenal, got Sellars his early attention and caused much of his trouble. At 26 he already had a MacArthur “genius” award and was appointed head of the American National Theater in Washington, D.C., where he raised hackles with expensive, lavish productions that involved huge casts, the experimental use of technology, and confrontations with government policy. The last straw for official Washington was a 1986 staging of Sophocles’s Ajax, the Greek hero being played by a deaf-mute awash in blood and gore on the steps of the Pentagon. But with such productions that blurred the line between musical and straight theater, between ntertainment and political imperative, Sellars had begun what would become a wholesale reinvention of operatic acting. Because of Sellars, opera in America in 1990 had become a different art than it had been in 1980. He mounted his once notorious and now classic Mozart/da Ponte cycle in which The Marriage of Figaro, Don Giovanni, and Così fan tutte were given in a present-day New York setting that used Mozart as a road map for the salvation of a Count in the Trump Tower, a drug-dealing womanizer in Harlem, and a bitter Vietnam vet running a diner. But for Sellars this was just the beginning. He moved to Los Angeles, and while he had already spent time in Japan, China, and India, he now broadened his perspectives to fully embrace Southern California’s vastly multi-cultural Pacific Rim and Latin- American expanse. He headed two wildly ambitious Los Angeles Festivals in 1990 and 1993, with hundreds of performances of world cultural events all over the city and its suburbs, including on the streets of South Central Los Angeles where the 1992 riots had occurred and where social unrest remained. He began teaching courses at UCLA in art as social action that overflowed large auditoriums. The Los Angeles Philharmonic’s visionary executive director, Ernest Fleischmann, made Sellars a consultant—in essence a dramaturge—of the orchestra, someone who could serve as a guide to L.A. for Salonen when he became music director of the orchestra in 1992. Sellars’s first task was to convince Salonen to conduct Messiaen’s Françoise with the L.A. Phil at the 1992 Salzburg Festival. This led to a string of L.A. Phil projects and festivals, among them “The Tristan Project” that included video by Bill Viola and was the first big production to reveal the theatrical possibilities of the newly built Walt Disney Concert Hall. Sellars’s work in the past quarter century is far too extensive to list. A number of his hundreds of productions have broken new theatrical ground. His Desdemona reimagines Shakespeare’s Othello from the women’s point of view, with a text by Toni Morrison and music by the Malian singer and songwriter Rokia Traorè. In Peony Pavilion, the Chinese Kunju tradition confronts Tan Dun. There have been other festivals. In Adelaide, Sellars’s artistic ambition overestimated Australian conservatism. But in Vienna, Sellars was given 10 million euros to oversee a highly successful 2006 Mozart festival in which a host of new work—Adams’s The Flowering Tree and Saariaho’s La Passion de Simone, films from Africa and Asia, Maori dance—was premiered. And Mozart’s legacy was also explored from political perspectives, among them the necessity of sustainable food. What has most marked Sellars’s work, though, has been his efforts toward sustainable art. He makes projects not for the moment but as ongoing labors of investigation. New operas and opera stagings are never fixed but revised at every revival. Sellars is also a fixer, as he was when he instituted a complete rewriting of Golijov’s initially uneven opera, Ainadamar, which has become yet another Sellars-induced classic. That sustainability requires unprecedented devotion. Sellars is known for generating endless discussion, one of his most consistent themes is the use of theater to address the failure of communication, to make heard voices rarely offered a megaphone. The talk never stops. No one but Sellars could have gotten away with eight days of discussion as part of the chorus’s rehearsal process in Berlin for the St. Matthew Passion. In 2009, Sellars staged Salonen’s farewell concert as L.A. Phil music director, ending with a ritualized performance of Stravinsky’s Symphony of Psalms amid African sculpture and transcendent lighting by Sellars’s longtime lighting designer, James Ingalls. When Stravinsky’s final quiet chord, a chord like no other in music, mystically died away with impenetrably quiet spiritual majesty, it generated a half-hour standing ovation, during which the entire orchestra spontaneously lined up on stage. One after another, the teary players hugged their red-faced music director. There was not a dry eye in the house. Mark Swed is the music critic of the Los Angeles Times.